As announced at the beginning of the National ICT month 2017, the Department of Information and Communications Technology (DICT) in the Philippines has released the National Broadband Plan (NBP). In his first State of the Nation address in July 2016, President Duterte directed the newly created DICT to develop a National Broadband Plan to accelerate the deployment of fiber optics cables and wireless technologies to improve Internet speed. In March 2017, DICT released the working draft of the NBP on its website, and invited inputs and comments until 24th March 2017. The vision is to have Open, Pervasive, Inclusive, Affordable and Trusted Internet Access. The plan states that in line with this vision, the government will set policy, regulatory, and infostructural interventions to spur competition in the telecommunications and ICT industry. The plan examines, defines, and limits the scope of issues, key supply-side and demand-side strategies, and initiatives to address gaps in the broadband environment particularly on accessibility, affordability and quality of broadband services, as well as existing policy and regulatory issues that hinder infostructure deployment. Further, the NBP will lay down approaches in engaging the public and private stakeholders. The plan will focus on the realisation of the following four outcomes (our detailed summary of the draft plan, which talks about these outcomes in more details is available here). 1) Accelerated Investment: The government will develop responsive policy and regulatory issuances and provide necessary interventions and incentives to accelerate investment, particularly in the countryside. It is hoped that these will attract existing and new market players to invest in unserved and underserved areas and improve services to the currently serviced areas. 2)Mobilised and Engaged Public and Private Sectors: The government will forge strategic partnerships and engagements with private sector and industry players, civil society organizations, and academia, by laying down mechanisms, to facilitate the participation of these entities in the development of the telecommunications and ICT sector. 3) More Places Connected: Initiatives or interventions will be set to connect government agencies, schools, health institutions, Micro, Small and Medium Enterprises (MSMEs), among others to broadband infostructure. Efficient management of spectrum and the adoption of satellite and emerging technologies in broadband deployment will be ensured. 4) Increased Take-up Rate: This will be brought into fruition by the provision of programs that will stimulate the demand for broadband such as: promotion of the use and production of local content and applications; conduct of digital literacy programs; and introduction of fiscal incentives to broadband users, among others. Three major broad strategies are being adopted to achieve these outcomes, namely: 1) Policy and regulatory reforms; 2) Investment in broadband infostructure; and 3) Government support to stimulate broadband demand. The plan recommends reforms for existing frameworks governing the industry, in order to cope with new trends in technologies and collaboration between the government and legislative body to enact new suitable legislations. Under the investment area, a Philippine Integrated Infostructure (PhII) will be established, which is expected to provide at least 10 Mbps of internet download speed to cover households by 2020 affordably. It will provide a demand responsive core and aggregation network for national government agencies (NGAs), local government units (LGUs), public elementary and secondary schools, state colleges and universities (SUCs), public hospitals and rural health units (RHUs), among others located in the identified growth centers. It will also leverage the existing government assets and initiatives such GovNet, IGovPhil, Free WiFi in Public Places, and Tech4ED to further lower implementation costs. Options of direct government build and operation, PPP arrangement, and subsidised investment will be considered for the PhII. As part of the third strategy, the government will establish necessary “pull” measures to stimulate demand. 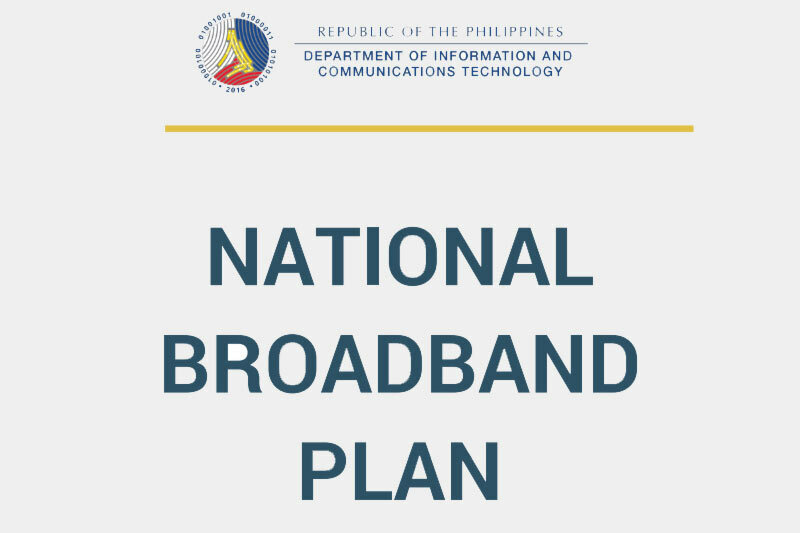 Planned steps include support for local content development (through APIs to enable websites to offer content in major Philippine dialects and incentives for local content developers), conduct of capacity building and information outreach programmes and introducing incentives for broadband users, maybe through an “access device” broadband scheme, which could be integrated with existing programmes, particularly those dealing with marginalised segments.